Skrillex is going to be releasing new music this year, if his OWSLA label mate Josh Pan is to be believed. 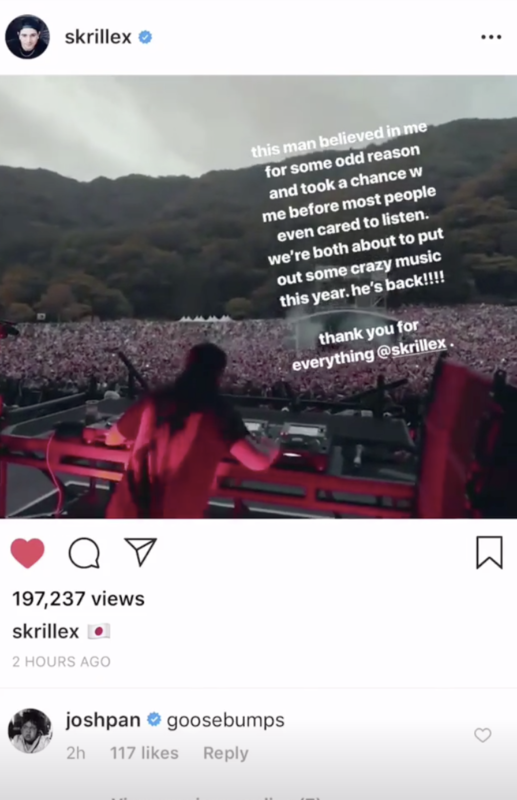 In a recent Instagram post, producer Josh Pan filmed Skrillex playing at Japan’s Fuji Rock festival and wrote about how the OWSLA founder had “believed in” him and “took a chance” on his music at the beginning of his career. Of course, Sonny Moore hasn’t been resting on his laurels. Last week, he and his former band From First To Last released a new single, ‘Surrender’. Also, back in May, an Instagram post made it look as though Boys Noize and Moore were back in the studio together, raising hopes among fans that a Dog Blood reunion could be on the cards.